Has the Steelers Stevan Ridley Reclamation Project Run Its Course? NFL “Street Free Agents” are just what the name implies. Players who get signed off of the street. Steelers General Manager Kevin Colbert has a pretty good record when it comes to signing Street Free Agents. Kickers Matt McCrane and Randy Bullock provide to recent examples. 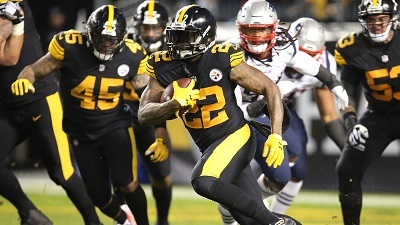 Stevan Ridley is another one of Kevin Colbert’s Street Free Agent signings and his impending free agency provides a good time to assess how well the Stevan Ridley reclamation project has worked. 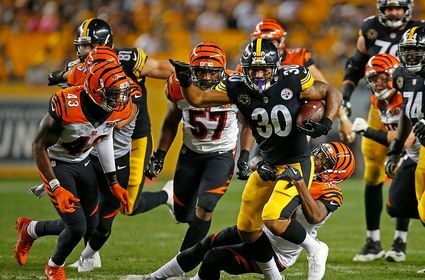 When James Conner got injured in the infamous Steelers 2017 loss to the Patriots, the infamous Jesse James game, Fitzgerald Toussiant was Le’Veon Bell’s only experienced backup. Kevin Colbert wasted little time signing Stevan Ridley who’d been a quality NFL running back before injuries derailed his career in 2014. Stevan Ridley saw immediate action in the Steelers Christmas win against the Texans and in their season finale against the Browns. The Steelers resigned him in the 2018 off season, and Ridley began the 2018 season as James Conner’s primary backup, ahead of Jaylen Samuels. Ridley only got 29 carries and saw 3 balls thrown his way, managing a 2.8 yard per carry average. Worse yet, he fumbled twice. It IS true that Stevan Ridley’s ball security are at issue, and that his average is unimpressive. Yet the sample size is small, and Stevan Ridley also looked good at times, including in the Steelers win over the Patriots. The Steelers need depth at running back, and Stevan Ridley provides an experienced hand behind Conners and Samuels. It is hard to justify a modest signing bonus and even a roster spot on Stevan Ridley when the Steelers should be looking to fill that role with a young player for the 2019 NFL Draft. Stevan Ridley’s future in Pittsburgh could largely depend on the Steelers overall approach to building their running back depth chart. For the last several seasons, the Steelers have opted to go with a starter, a competent backup and untested younger player manning the third running back slot with Roosevelt Nix rounding out the group at fullback. If you’re a regular reader of this site, you know that I think the Steelers need to beef up their running back depth. If the Steelers stick to form, and only carry 3 running backs plus a fullback, it would be a mistake to keep Stevan Ridley as that third running back. However, if the Steelers find a good back to complement James Conner and Jaylen Samuels, a 2019 equlivent of 2008’s Mewelde Moore, than Stevan Ridley could be a good candidate to occupy that 4th slot, much as Gary Russell did in 2008. However, with Antonio Brown set to leave town, the Steelers will need to add extra bodies at wide receiver to supplement JuJu Smith-Schuster, James Washington and possibly Eli Rogers as targets for Ben Roethlisberger. That being the case, it is likely that the Steelers Stevan Ridley reclamation project has come to an end. What’s the Pittsburgh Steelers biggest priority of the 2019 off season? Well, improving at inside linebacker and at cornerback (if not safety as well) top everyone’s list. As they should. Next comes finding someone to “replace” Antonio Brown. That’s where most people’s lists tend to end. They should not. It is kind of funny if you think about it. Steelers fans find no shortage of topics to criticize Mike Tomlin on these days, whether its clock management, challenges, talent evaluation, locker room control or getting tripped up on trap games. But people rarely, if ever mention the inability of Mike Tomlin teams to reach season’s end with both RB Number 1 and RB Number 2 healthy. Yet the numbers are there for all to see. 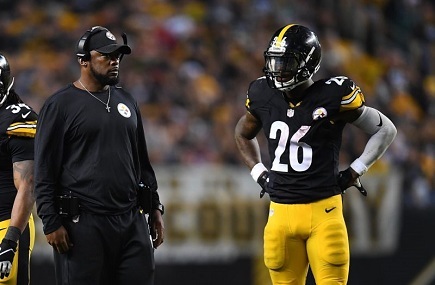 Whether we’re talking about Willie Parker, Rashard Mendenhall, Le’Veon Bell or the duo of Jonathan Dwyer and Isaac Redman, Mike Tomlin has shown little inclination to limit the work load of his starting running backs. While that’s a debatable strategy to begin with, it is even more dubious if when you fail to adequately staff your running back depth chart. This is after all the team that started Ben Tate, Josh Harris and Dri Archer in the playoffs one year, and Fitzgerald Toussaint and Jordan Todman a year later. While the Steelers brass hasn’t issued a mea culpa, there are signs that the coaches have realized they have a problem. Before it became clear that Le’Veon Bell’s hold out would become permanent, James Conner was on track to touch the ball 378 times this year. 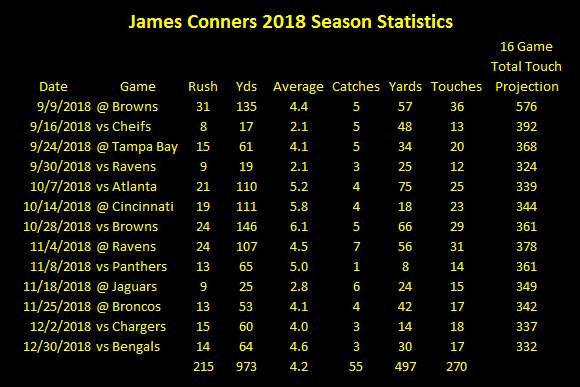 Although the Steelers dramatically cut back on Conner’s carries starting with the Panther’s game, James Conner got hurt anyway. That forced rookie Jaylen Samuels into the starting role despite never having played running back full time in his football life. Fortunately, Samuels was up to the task. Unfortunately, it left the Steelers one play away from starting Stevan Ridley or Trey Edmunds as their starting running back. Consequently, Ben Roethlisberger was forced to throw a record 675 passes. The Steelers offense couldn’t control the clock, and airing the ball out resulted in more turnovers – even if Ben Roethlisberger’s interception percentage was down. While it is easy to play arm chair head coach and criticize Mike Tomlin and Randy Fitchner for passing too much, the fact is that their personnel left them little choice. This is one case where the arm chair general managers have the upper hand. Steelers history backs this up. But it is also true that the Steelers lone Lombardi Trophy of the Tomlin era came in 2008, when the front office had the foresight to staff a running back depth chart that was 3 and arguably 4 players deep. The plan was rely on Willie Parker and Rashard Mendenhall, with Mewelde Moore and Gary Russell serving as backups. Willie Parker got hurt in week 5 against Philadelphia, and Rashard Mendenhall got hurt in week 6 against the Ravens. Mewelede Moore hadn’t just been overlooked by the Pittsburgh media, having signed as a free agent the same day Ben Roethlisberger signed his first extension, the coaches had ignored him too as Carey Davis got the call when Mendenhall got injured in Baltimore. But the next week against Jacksonville, the Steelers started Moore who rushed for 99 yards and caught 17 more in the air. Moore rushed for 120 yards the following week, and piled up just under 800 all-purpose yards while only making 4 starts. I’ve long argued that Mewelede Moore was the unsung hero of the Steelers 2008 season which ended in victory at Super Bowl XLIII. How might have 2018 turned out had the Steelers dedicated a roster spot to another running back instead of say, Justin Hunter? We’ll never know. But we do know that the Steelers brass’ decision to staff running back depth charts which are essentially only two players deep has carried steep costs in December and January time and time again. James Conner and Jaylen Samuels give the Steelers two good backs going into 2019. Regardless of whether he comes from free agency or the 2019 NFL Draft, the Steelers must bring a third running back to Pittsburgh; Kevin Colbert and Mike Tomlin must find the 2019 equivalent of Mewelde Moore. As Kevin Colbert announced yesterday, the Pittsburgh Steelers have decided not to apply the transition tag or the franchise tag on Le’Veon Bell. The move comes as a bit of a surprise because the Steelers had seemed intent on playing hard ball with Bell. They have chosen not to, and that decision might signal that Art Rooney II has mastered one of the one of the most important tests of his tenure as Steelers president. Our third and likely final free agent focus profile of Le’Veon Bell reveals why. Here’s the digest version based on our 2017 and 2018 free-agent profiles of Le’Veon Bell. In his rookie training camp, Ed Bouchette boldly compared Le’Veon Bell’s debut to that of Franco Harris. Journalists such as John Stiegerwald were skeptical, yet Jim Wexell tracked Bell’s rookie performance against Walter Peyton’s as a rookie. Six years later, Le’Veon Bell has set regular season and playoff rushing records that neither Harris, Jerome Bettis, nor John Henry Johnson could set. A lot of signs indicate yes, however the fact that Bell has played only one complete season and been hit with two suspensions raises doubts. The Steelers decision seems clear, but the point of this exercise is to make the strongest case possible for keeping Bell so here goes. On paper there’s a case for the Steelers resigning Le’Veon Bell to a long-term deal. There’s also a case for using the transition tag on him. Even if the Steelers can’t sign Le’Veon Bell to a long term deal, the case for putting the transition tag on him is strong, in theory. As one Steelers scribe privately remarked when Bell’s 2018 holdout became permanent, “It would basically dare any other NFL team to improve on the offer the Steelers made last season.” It would also give the Steelers the chance to match that offer. Theoretically, the Steelers could also match the offer and then trade him to someone else. And a trade could bring the Steelers a pick in the 2019 NFL Draft whereas any compensatory pick would only come in 2020. With a strike or lockout looming, a draft pick in 2019 helps the Steelers far more than one in 2020. The Steelers were prepared to commit an eight-figure salary cap to Le’Veon Bell in offers made in 2017 and 2018. Yet, James Conner delivered excellent production (although not ball security) in 2018 and he’ll only make $844,572 in 2019. The Steelers can use the difference to bolster their defense, which needs the help. Beyond salary cap dollars and sense, not having Le’Veon Bell probably cost the 2018 Steelers the playoffs. 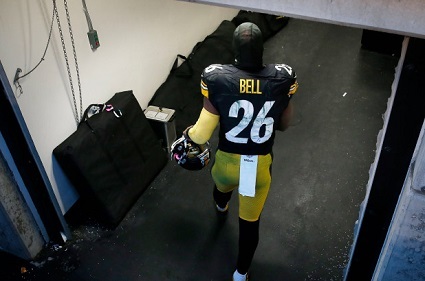 Bell’s behavior and the gap between his actions and words widened in 2018. Do the Steelers need another potential locker room distraction? Ah, no. Using the transition tag on Bell carries risk as well. First, the transition tag ties up valuable salary cap dollars that can’t be used while the Bell situation sorts itself out. Forget Bell signing his tender so that the Steelers can trade him. The Steelers could try to “match and trade” but would need to complete the trade on the same day to avoid a salary cap hit. Finally, if the Steelers tag Bell then decline to match, they get nothing. During the 1990’s, it often felt like the Steelers served as the NFL’s farm team. Pittsburgh would develop players like Chad Brown or Yancey Thigpen only to see them leave as free agents. The Rooneys promised things would change with a new stadium. Heinz Field opened in 2001, and since then the Steelers have done a remarkable job of keeping their own players since then. Retaining key players has been critical to the Steelers overall success in the 21st century and critical to their victories in Super Bowl XL and Super Bowl XLIII. But you can’t keep everyone. Knowing when to let a player walk is just as important as knowing when to keep him. For a long time it seemed like Art Rooney II and the rest of the Steelers brass was determined to use the transition tag to exert some control over Le’Veon Bell’s fate. While that’s understandable, it doesn’t make sound football sense. In a perfect world, Le’Veon Bell would have signed the deal his agent had agreed to with the Steelers. But Bell declined. The Steelers gave it a second go around, and Bell sat out all of 2018 while trolling his team at every chance he got. The Steelers are going to let Le’Veon Bell walk and that is the right decision. Le’Veon Bell to Sit Out 2018 – The Le’Veon Bell-Steelers Soap Opera Ends. Finally. It’s over. Thank God. The Pittsburgh Steelers-Le’Veon Bell soap opera ended today as the 4:00 pm deadline came and went without Le’Von Bell signing his franchise tender. Now Le’Veon Bell cannot play for the Pittsburgh Steelers in 2018, and he’ll forfeit the entire 14.5 million he was due under the franchise tag. The move also effectively ends Le’Veon Bell’s career as a Pittsburgh Steeler. In football terms both sides lose here, at least in the short term. While James Conner has excelled in Le’Veon Bell’s absence, the drop off from James Conner to Stevan Ridley and Jaylen Samuels is large. Today the Steelers are legitimate Super Bowl contenders; a serious injury to James Conner immediately downgrades them to a team that, with a few breaks, could win perhaps win a playoff game. In addition to losing the money, Le’Veon Bell loses a shot at winning a Super Bowl in 2018. While there’s little doubt that some team, awash with salary cap space will offer Le’Veon Bell more than the Steelers were able (or willing) to pay, money won’t buy Bell a championship. Sure, Le’Veon Bell could find himself with the Eagles or Patriots in 2019. Even the Browns, who have gobs of cap sapce, are broaching respectability, seem to have a legit quarterback and could become formidable by a soon as next year. Ah, but what if the biggest offer comes in from say, the Oakland Raiders….? But the post-Pittsburgh Steelers portion of Le’Veon Bell’s story remains to be written, and others will write it. While yours truly wishes Le’Veon Bell would have come back to play out his franchise tag, I’m also glad the fat lady has sung on this soap opera. The Le’Veon Bell-Steelers story has simply become tedious. Sure, the Steeles misjudged things when they used the 2nd Franchise tag. But the Steelers sincerely desired to sign Le’Veon Bell to a long term deal. While the Steelers reported offers might not have reached the levels that Franchise Running Backs of yesteryear enjoyed (i.e. Emmitt Smith, Barry Sanders, Marshall Faulk), they were ready pay Bell far and above his peers. As for Le’Veon Bell? Yes, Bell said he would hold out (he also said he’d retire) if he got a 2nd franchise tag. He’s also said a lot of other things, some of them even wrote right side up. And that has been the most aggregating plot line of this entire soap opera. And at almost every stage, Le’Veon Bell’s actions have contradicted his words. Yet that hasn’t stopped both fans and much of the professional press, from hanging on Le’Veon Bell’s every word, acting as if the Burning Bush itself is speaking. Did Le’Veon Bell show up to start the season as he promised he would? No. Nonetheless, “Sources” indicated he’d show up during the season’s 1st six weeks, and people believed them. Except he didn’t show up. Then Bell himself told ESPN’s Jeremy Fowler he was going to show up at the bye week. Everyone bought it, until he didn’t show up. Then of course Bell was waiting to darken doors on the South Side until the trade deadline passed. It passed and Bell remained in Miami. And while we’re at it, did anyone really believe those trade rumors about Le’Veon Bell? I don’t know about you, but those always struck me as more mischief than anything else. Thankfully, all of that stops today. Sure, they’ll be talk about the Steelers using a third franchise tag on Le’Veon Bell or even the transition tag (again, do does anyone believe that the Steelers really told Le’Veon Bell they were going to transition him in 2019?) But all indications are the Steelers are ready to move on. And, while that’s the right move on the part of Mike Tomlin and Kevin Colbert, that’s a shame. Ben Roethlisberger, Antonio Brown and Le’Veon Bell are probably the three men most responsible (well, you’d have to add Cam Heyward and make it a quartet) for the turn around the franchise has seen since starting 2-6 in 2013. It would have been perfect for Pittsburgh to see the Killer Bees standing on the dais, hoisting Lombardi Number Seven together. That will never happen now. So be it. Finally we can accept it and move on. Every week James Conner seems to push LeVeon Bell’s holdout further and further into irrelevancy. And so he should. With the season half over, not only does no one in Pittsburgh miss Le’Veon Bell, but James Conner is arguably Steelers offensive MVP. So it is hardly a surprise that Le’Veon Bell’s “Fairwell Miami” tweet which again tantalized an end to his holdout barely moved the needle in Steelers Nation, save for the mandatory regurgitation from the content aggregation sites. James Conner stiff arms Myles Garrett. Photo Credit: Barry Reeger, PennLive. But no matter how fed up Steelers fans are (and should) be with Bell’s antics, Steelers Nation would be wise to welcome Le’Veon Bell back should he “volunteer” to return to the South Side next week. And that’s because James Conner’s rushing style carries consequences. If you’re a true Steelers fan, a “Three Yards and a Cloud of Dust” purist there’s no way you can watch James Conner’s bruising rushing style and not feel a surge in your Black and Gold blood pressure. Just how hard does James Conner rush? Well per Jim Wexell’s reporting on Pittsburgh 247, in the Steelers win over the Bengals at Paul Brown Stadium, James Conner ran so hard he knocked both linebacker Nick Vigil and strong safety Shawn Williams out of the game. While no true fan of the game ever roots for another player to get injured (well, maybe except for Vontaze Burfict) Steelers fans like tough running backs who rush hard and dish out as much or more than they take. If pressed to tell the truth, Steelers fans from Generation X and above would probably confess to being just as upset that the ’94 AFC Championship loss robbed them of a chance to see Barry Foster run full speed at Deion Sanders as they were at losing a shot at One For the Thumb. Ah yes, Barry Foster the man who still holds the Steelers single season rushing record. The man who once boasted about accelerating before getting tackled, just so that he could inflict a little more pain on the defenders. Barry Foster, the man whose body fell apart and was out of football 2 years after that record setting 1992 season. OK. Maturity and motivation issues were as a big a factors as durability in the rapid end to Barry Foster’s career, but Foster missed significant time to injury in ’91, ’93 and ’94. Being a runner who craves contact as Conners must also carries its costs. Who knows if Le’Veon Bell will show up on the South Side in time to sign his Franchise Tender? From a pure business perspective, Le’Veon Bell has more to lose than to gain by showing up. But let’s fancy the idea that a chance to win a Super Bowl does interest Le’Veon Bell enough to play out the final 7 games of the 2018 season. If he does then he certainly must take a back seat to James Conners, but Le’Veon Bell would provide exceptional depth and insurance against injury that neither Stevan Ridley nor Jaylen Samuels could provide. The Pittsburgh Steelers would be 1-0 today if Le’Veon Bell had shown up and reported for work as expected. The reason is that, if the Steelers missed anything from Le’Veon Bell on Sunday, it was Le’Veon Bell’s ball security skills. Yeah, yeah, I know, I know. It IS a strange thing to read from a writer who has already done the cyberspace equivalent of taking pen to paper to argue that James Conner shouldn’t be scapegoated for the Steelers 21-21 opening day tie against the Browns. But if you read on, you’ll see that my argument isn’t any sort of hypocritical double-speak or some writer’s equivalent of buyer’s remorse, but rather simple numbers. And numbers don’t lie. When we talk about the all-time great players, we tend to focus on highlight-worthy qualities. For example, when you watch any film of Steelers Hall of Fame middle linebacker, Jack Lambert, it’s usually of Lambert crashing into a running back, yelling at an official or leveling a wide-receiver who made the mistake of trying to catch a pass in his area. As it pertained to the leveling of that wide-receiver and Jack Lambert’s area, the reason No. 58 was often in position to wreak havoc was because when he dropped back into pass coverage, there were very few linebackers of his era (or any era) who had the athleticism and football-awareness to get the depth necessary to put himself in the position to get those kill-shots he was so famous for. As it pertains to this era, when it comes to Steelers’ superstar running back, Le’Veon Bell, his all-around skill-set may be unequaled. Like the rest of us, Le’Veon Bell is fully-aware of his greatness which, unfortunately, has led to the current hold out with the Steelers–his training camp absence has spilled-over into the regular season. 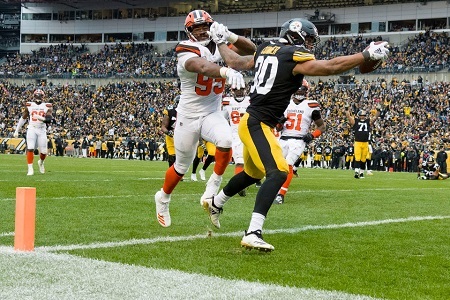 As a consequence, second-year running back James Conner was moved up the depth chart and started the Steelers’ Week 1 contest against the Browns last Sunday at FirstEnergy Stadium in Cleveland, Ohio. 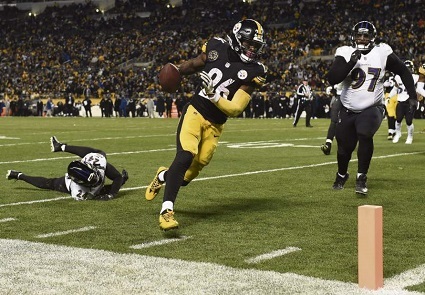 For three-plus quarters, Steeler fans may have been saying “Le’Veon who?” as Conner displayed very Bell-like attributes, while tallying close to 200 total yards from scrimmage. 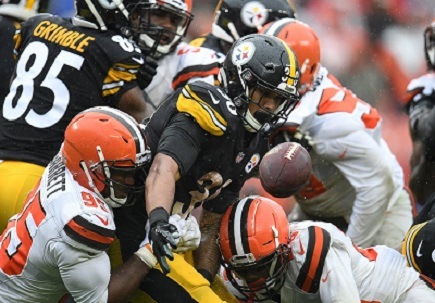 Sadly, midway through the fourth quarter, and with Pittsburgh holding what seemed to be a safe 21-7 lead, James Conner ignited a Browns’ comeback by fumbling at the Steelers’ 17-yard line, a play that led to a one-yard touchdown. The Browns ultimately tied the game at 21, a score that held all the way through to the end of overtime. 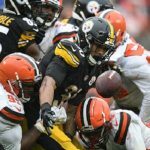 As I wrote on this very site earlier in the week, while James Conner’s gaffe was critical, there were other Steeler transgressions (such as Ben Roethlisberger’s in ability to sync with Antonio Brown and Big Ben’s 5 turnovers) that contributed greatly to the Week 1 sports equivalent to kissing your sister. Having said that, however, one has to wonder if Le’Veon Bell’s presence on the field would have prevented a Brown’s comeback, and that’s because Le’Veon Bell’s presence likely would have included much better ball security. Why? Because Bell’s superior skills aren’t just limited to patience, receiver-like hands and, oh yes, his ability to pick up blitzes (he may be the best in the business at that last one). Of all of Le’Veon Bell’s awesome attributes, perhaps the most underrated is his ability to hold onto the football, this despite having an insane workload through five seasons in the NFL. Including regular season and postseason games, Bell has 1,635 career touches (1,310 carries and 325 receptions), yet he’s only fumbled eight times. Looks a little more impressive now, doesn’t it? Not does Le’Veon Bell lead the pack, he leads it by a mile. Franco Harris, Jerome Bettis and John Henry Johnson, the Steelers 3 Hall of Fame running backs, all have fumble percentages well in excess of Bell’s. Rashard Mendenhall and Willie Parker fumbled the ball 1.1% and 1.3% of the time, or more than twice as often as Bell. 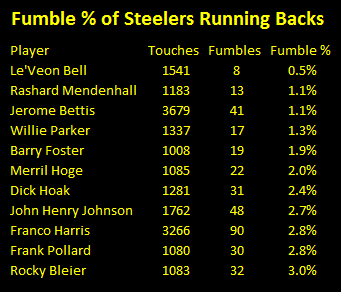 Merril Hoge and Barry Foster, fumbled the ball almost four times as often as Le’Veon Bell. Frank Pollard and Rocky Bleier fumbled the ball 2.8% and 3% of the time, or nearly 6 times as often as Le’Veon Bell. In fairness, seven of Le’Veon Bell’s fumbles came over the previous two seasons, which clocks him in at 0.9% but since we’re being fair, he also had a combined 742 touches. And that’s still far below the 2% fumble rate which is the average of the subgroup ahead. No matter how you break things down, Bell takes extremely good care of the football. Does this mean James Conner doesn’t take care of the football? Not at all. It just means he hasn’t logged enough reps to earn such a reputation at this point of his career. People talk about discipline in football and think they can point to certain behaviors away from the field as a sign that a player lacks it — Le’Veon Bell often frustrates Steeler fans with some of his “moves” away from the gridiron. But what requires more discipline and attention to detail than being able to hold onto the football when multiple defenders are trying to wrest it from you 35 times a game? Le’Veon Bell does many things well on the football field, and if he was in the lineup last Sunday, chances are, the Steelers would be 1-0. Le’Veon Bell’s absence and refusal to sign his franchise tender has been discussed to death in Steelers Nation. But there’s one story element that has largely been ignored: Le’Veon Bell’s holdout leaves the Steelers running back depth chart in both a familiar and precarious position. James Conner 4th quarter run in 2017 Steelers win over Bengals. (Photo Credit: Justin K. Aller, Getty Images via Fansided. Since most of you don’t speak Spanish, Agus was asking if by keeping James Conner, Stevan Ridley, Jaylen Samuels Roosevelt Nix and Le’Veon Bell, the Steelers weren’t carrying too many running backs. My response was no, the Steelers weren’t keeping too many running backs. The answer surprised Agus and he asked me to explain. And I pointed out to the Steelers of starting Ben Tate, Fitzgerald Toussaint, Dri Archer and Jordan Todman in all too recent playoff games. The Steelers locker room is rallying around James Conners, who has had a strong preseason. Maurkice Pouncey even argued that were it not for his injury history, former Pitt Panther James Conners would have been a first round pick. I don’t follow college ball, but Pouncey went to a major NCAA program, so he has the credentials to speak on the subject. But what if James Conner gets hurt? That probably earned Sanders a spot in the roster, although the suspicion here is that had Bell reported on Labor Day, Jaylen Sanders very well might have joined Olasunkanmi Adeniyi on IR. Sanders will be on the roster and likely get a helmet on game day against the Browns. Which is good. Expect the rookie’s pass catching skills to be in demand with Vance McDonald out, and an injured Xavier Grimble starting opposite Jesse James in the number 2 tight end spot. Pro offenses have evolved, and the Steelers roster composition has evolved with it. The days of carrying 5 running backs and a fullback are probably over. Moreover, when Ben Roethlisberger is your quarterback, investing so much salary cap and roster space in your running back depth chart makes even less sense. But carrying only 3 running backs plus a fullback is cutting things a little too close. As observed here last month, the Steelers have struggled to keep their top two running backs healthy for an entire season during the Mike Tomlin era. In 2008, the Steelers lost Willie Parker for a spell, then lose Rashard Mendenhall. Fortunately they had Mewelde Moore and Gary Russell to shoulder the load. In 2010 Rashard Mendenhall and Isaac Redman remained healthy for the entire season, with Mewelde Moore and Jonathan Dwyer only seeing spot duty carrying the ball. Both of those season ended with the Steelers going to the Super Bowl. That remains Pittsburgh’s goal this year, but even if James Conner performs above expectations, Le’Veon Bell’s holdout greatly reduces the Steelers ability to adsorb an injury at running back. We are disappointed Le’Veon Bell has not signed his franchise tender and rejoined his teammates. Coach Tomlin and the coaching staff will continue to focus on preparing the players on our roster for our regular season opener on Sunday against the Cleveland Browns. Colbert’s statement is a long way from “Franco who?” but it also underlines that the Steelers really have form of compelling Bell to rejoin the team. Per Jeremy Fowler’s report on ESPN, neither the Steelers nor people close to Bell is surmised by the All Pro running back’s no show, and given Bell’s erratic behavior this off season perhaps they shouldn’t be. Time to Panic? No. Time to Get Pissed? Yes. 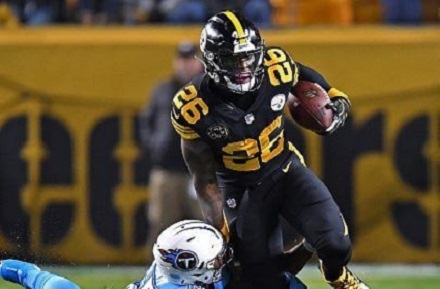 Le’Veon Bell has broken rushing records which neither Hall of Famers Franco Harris, Jerome Bettis, and John Henry Johnson nor Super Bowl record setter Willie Parker could touch. Among NFL players with 60 or more games, Le’Veon Bell leads them all in total yards from scrimmage. Despite those on-the field achievements, Le’Veon Bell has managed to make himself one of the most unpopular players in recent Steelers history. Steel City Blitz’s Ben Anderson is speaking for a large swath of Steelers Nation, including many of those who scoffed at the idea of running back by committee. Let’s clarify one thing. Unlike Hines Ward in 2005, Barry Foster in 1993 or Mike Merriweather in 1988, Le’Veon Bell has absolutely zero contractual or legal obligation to play for the Steelers. He’s not under contract, and has the option of giving up the 14.5 million franchise tender in exchange for sitting out the year. Some, such as James Harrison have advised Bell to do just that. But if that were Bell’s intent, he should have said so all along. So Steelers fans have every right to be upset with Le’Veon Bell. When an athlete makes it clear he’s not giving any hometown discounts and that he’s firmly focused on the bottom line, such mercenary attitudes can rub us the wrong way, but at least the athletes are being honest. When the talk a good game a la Neil O’Donnell about money not being their sole motivating factor and then behave differently, that’s something else. With that said, there is no reason for fans to panic at this point at least. Le’Veon Bell’s share of the Steelers offense. James Conners, Stevan Ridley, and Jaylen Samuels showed a lot of promise, but expecting the trio to make that up simply isn’t realistic. And with Vance McDonald‘s status unknown, there’s no obvious replacement as a check down option for Ben Roethlisberger when Antonio Brown, JuJu Smith-Schuster and James Washington are covered downfield. But given Le’Veon Bell’s erratic behavior, he could merely be intent on enjoying a full Labor Day weekend before reporting or perhaps he’s planning on reporting in before the Browns game soon enough that he can collect his $852,000 game check but late enough that Mike Tomlin will not play him. In order to accrue a full season of seniority, Le’Veon Bell must report for at least 6 weeks before the end of the season. To get to that point, Bell will have to forfeit nine million dollars in change. And for all antics thus far, Le’Veon Bell hasn’t shown himself as someone willing to leave that much money on the table. Yet.